Tomorrow is the day. Sadie Rose will begin her first day at pre-school. She will be attending Temple Beth El Child Development Center here in Riverside and we are very excited. The Lord has opened a door for her to be in a great program with fabulous teachers, many of whom are also on Early Childhood faculty at CBU. She will begin this summer as part of the 8-week summer program, attending only two 1/2 days a week. Then, starting in the fall, she will be there for two full days…two very long days. And so we are blessed to have these summer weeks to help her get adjusted to her new school, new friends, new teachers, new rules, and new experiences. Some have said that tomorrow I will cry. I will cry as I say goodbye to my little girl, who is no longer a little girl. Yes, it will be an emotional time, and only tomorrow will tell whether I sob, shed one or two tears, or simply delight in this new adventure. Yes, that is where I think I am most apt to place my emotions. Excitement. I am excited for Sadie Rose. 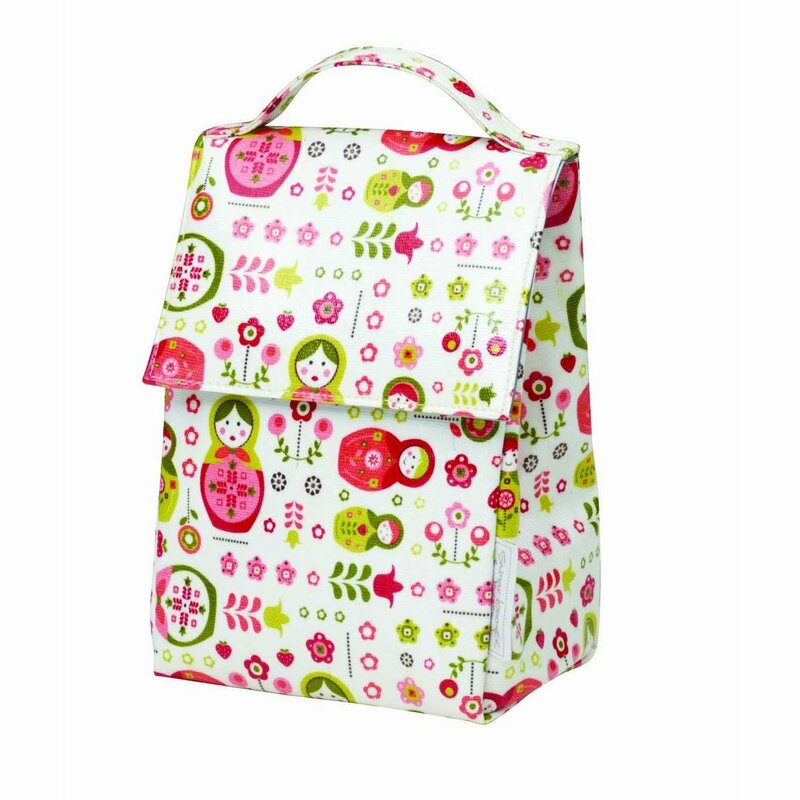 I have been waiting for three years to send her off to school with her cute little back pack and lunch. And thanks to the world of Pinterest, I have been able to develop some really cute ideas. A Butterfly Snack with Goldfish & Grapes. This little treat was the first item into her lunch. 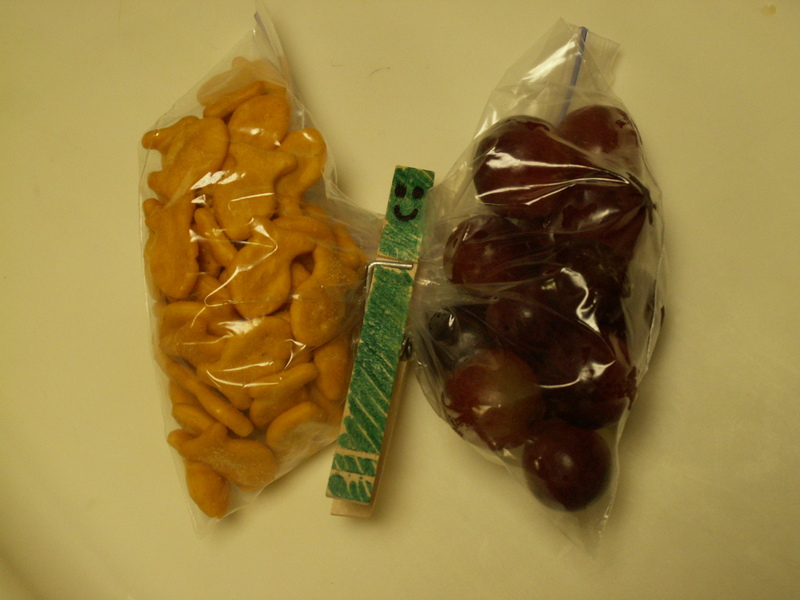 Just a simple ziploc sandwich bag, a handful of grapes, a handful of goldfish, and a wooden clothes pin colored to your liking. I really think Sadie Rose is going to enjoy this. Emergency Kit for Pre-School. 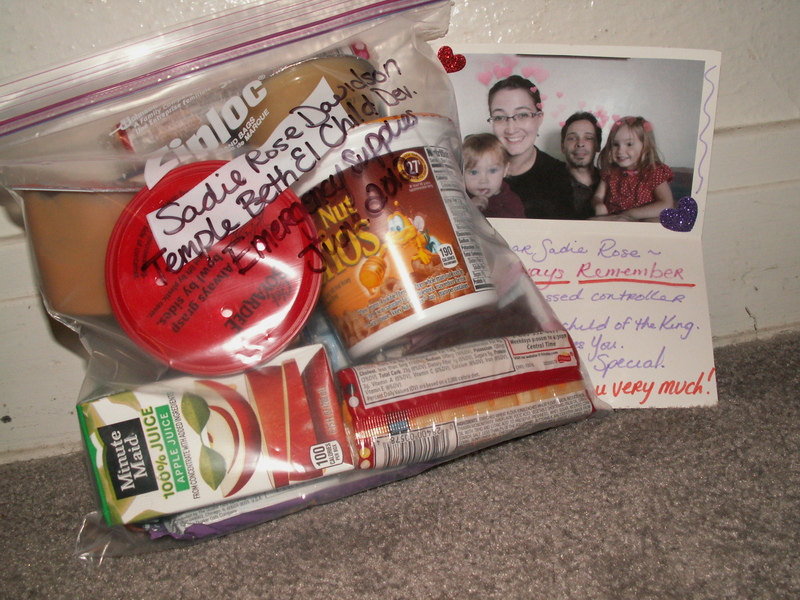 Includes enough food for 24 hours and a love note from Mommy & Daddy. And one package of moist towelettes. Check out the entire Sugarbooger line on Amazon. We were very impressed. So, there goes. She is packed and ready to go for her first day at pre-school…and we’ll just have to wait and see what’s in store for Mommy’s tears.